Successfully Added Drivers Edge - HID Xenon Headlamp Kit (H7) to your Shopping Cart. Safety, performance, style - HID Xenon bulbs are the driver's edge for a better ride every time. If you find yourself driving at night or occasionally in poor weather then you owe it to yourself to replace your existing headlights with these HID Xenon bulbs right away! Night and Poor Weather Driving: It's been shown that visual clarity at night is only 5% of what it is during the day. Perception field, color details, and contrasting ability goes way down at night and as a result, the risk of accident goes way up. The situation isn't much better for driving in bad weather especially in fog or storm conditions. Drivers need good visibility to make the correct driving decisions! Lives depend on it. Introduced in the 7-series BMW during the early 90's, High Intensity Discharge (HID) Xenon headlights have become the choice of serious drivers because they produce three times more light and brightness than halogen bulbs making them far superior for driving in all conditions. Yet because their glow resembles natural daylight, they don't cause temporary blindness to oncoming drivers. Farther, Wider, Clearer: On average HID Xenon bulbs produce 2,800 to 3,500 lumens of brightness versus traditional halogen bulbs which only produce between 700 to 2,100 lumens. What's more, HID Xenon bulbs produce 90 candelas of luminance per square meter versus traditional halogen which only produce 30 candelas of luminance per square meter. The real world benefits of these numbers - you are able to see an extra 30-60 meters or up to 15 car lengths farther to avoid dangers. Your peripheral vision is almost doubled to account for pedestrians and animals that might suddenly dart onto the road. You're able to discern greater detail in the environment from which to base your steering or braking decisions on! Efficiency and Durability: What surprises most people about HID Xenon bulbs is that despite producing 3x more light, they consume approximately half the energy which halogen bulbs use. This is because traditional halogen bulbs require a filament by which to produce light, whereas HID Xenon bulbs use electrical arcs in vaporised Xenon to create their brightness. And it is precisely for this reason that HID Xenon bulbs last longer than Halogen - there is no filament to burn out. In fact, HID bulbs usually last between 2000-3000 hours compared to 450 and 1000 hours for halogen lamps. Traditionally, the only downside of HID was the cost. Because of their superior quality and longevity, they were priced far above halogen lamps. No more. With Chinavasion's market share in wholesale electronics, we're able to bring you factory prices on these must have HID Xenon headlamp kits. Perfect for DIY'ers, it's everything you need to replace your existing headlamps with more powerful, safer HID Xenon technology. Click "Add to Cart" now to try them out for yourself. Once you see how great they are, order more for the resale market. Brought to you by the leader in online direct from China wholesale electronics, Chinavasion. Reduced power consumption means less fuel consumption, so HID Xenon bulbs help you save money at the gas pumps! The superior performance of your headlights could very well mean the difference between stopping in time and being involved in a serious accident! We highly recommend that you check your owner's manual if you are unsure of your car's lamp base. Are these bulbs used for low beam or high beam replacements? These bulbs are replacements for low beam, normal night time or poor weather driving lights. Their brightness and strength extends driving vision and enhances safety. Will these bulbs blind oncoming drivers? No. Despite their brightness, their glow most closely resembles daylight and does not cause a blinding glare. GREECE delivery in five days. Very good quality easy installation. BRAVO chinavasion. very good service. I received HID kit a approx. month ago. So far not to much experience. 1. Installation is like a breeze. it took me half hour to install both head lights. 2. Headlights fitted perfectly in their spots. 3. Lights in the night is GREAT even that my headlight glass is deteriorated. Installed on KIA SEDONA 2005 (Anniversary Edition) - Perfect. All is as described on website. very good product. works as described. fitted on passat 2002. very delighted. recommend to every one!!! 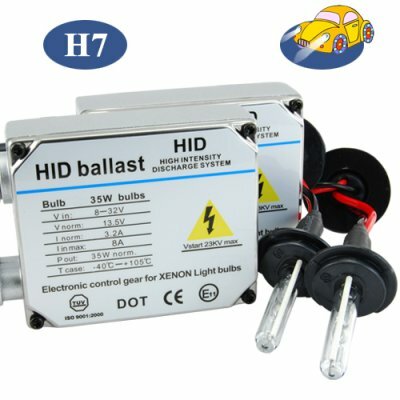 Un producto 100% recomendable, no encontraras un HID con la luz mas blanca a este precio, no llama nada la atención parece de serie.